On the back of this volume it says: “widely considered the best storyline…” Well if that isn’t setting yourself up for a fall I don’t know what is. Does it mean the next 10 volumes won’t be worth buying if you don’t like this one? It is however an absolutely cracking story. 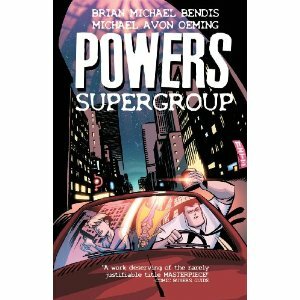 The great thing about Powers is seeing what aspect of the Super-mythos or real life will get the Bendis treatment next. This one is quite a popular subject – government sponsored heroes. Naturally all governments sponsoring supers are evil, corrupt, naïve, self-serving or similarly detestable. This storyline has been tackled by such masterpieces as Authority, Supreme Power and so on. Bendis does not disappoint and it is all wrapped up in that neat little trademark whodunit format. All the checks for a great Powers story are here. There is another revelation about Walker, an unexpected death, great art, fantastic colours, an emotional rollercoaster and more genre innovations than you could shake a fist full of sticks at. We also get to see action take centre stage for the first time in what is basically a detective story. In many works action is either padding for a lack of writing or grandstanding by the artist. Here it isn’t gratuitous, is wonderfully coloured and the shock ending takes your breath away. Special mention should go to the lettering. You don’t see many innovations in this area but this book innovates more than any other. Well done. This is probably the best and certainly most gripping tale yet and you are left wondering how they could possibly follow it up. The characters are left in a right pickle and how can anything be the same again. Will the next volumes come close or should I quit on a high? But all is not perfect. Why does such a mainstream book have so many typos in it? If I can spot them then surely all the writers, artists, inkers, letterers, editors and minions that see this book before me could have too. I am always pleased to see an ethnically diverse cast of characters but please try and get their speech right. I am fine if they all talk like stereotypes. I am fine if they all talk like me but don’t make them switch constantly mid-speech bubble. Disappointing. But not enough to spoil what has been a Double Thumbs Up! This entry was posted in Graphic Novel and tagged Brian Michael Bendis, DOUBLE Thumbs Up!! by 365gn. Bookmark the permalink.